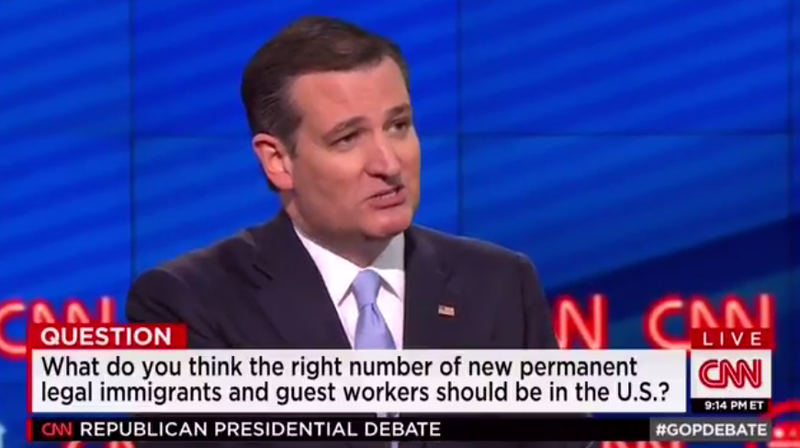 During the CNN Republican presidential debate Thursday night, Texas Sen. Ted Cruz vowed to eliminate welfare benefits for anyone living in the United States illegally. He laid out his immigration plan, which includes building a wall, tripling border patrol, and putting an end to sanctuary cities. “And let me tell you how we’re going to do that: We’re going to cut off taxpayer funds to any city that defies federal immigration law,” said Cruz. In addition, if elected president, he plans to end welfare benefits for illegal immigrants. “We’re gonna end welfare benefits for anyone here illegally,” he added. Listen to the rest of Cruz’s remarks in the video clip below.